Kalamazoo, MI: On October 20th, 2018 at about 3:45A.M. Kalamazoo Department of Public Safety officers responded to 1300 Fox Ridge Dr for a report of a male subject that had been stabbed in the chest. Upon arrival Officers located a 19 year old male victim who had sustained a puncture wound to the chest causing internal injury. The victim was transported to the hospital and is in critical condition. 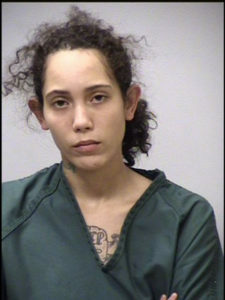 The suspect in this case has been identified as 23 year old Shelby Perry, who is approx 5’4” tall, weighing 150lbs with a tattoo on her chest and right leg. Perry’s last known address is also in the 1300 block of Fox Ridge Dr. She is still believed to be armed with a knife and is considered dangerous. A recent photograph is attached to this new release. Anyone knowing her location is asked to call the Kalamazoo Department of Public Safety at 269-337-8994, dial 911 or contact Silent Observer at 343-2100.